An image of galaxy cluster Abell 1033, which recently collided with another galaxy cluster. The shockwaves created in the collision caused a dim cloud of electrons to once again start radiating light (mostly radio waves). Astronomers have found evidence that a collision between two galaxy clusters sent shock waves through a once brightly radiating cloud of electrons, bringing the cloud back to life. Scientists are referring to the resurrected cloud as a "radio phoenix," named after the mythical bird that is reborn from its ashes, because the high-energy electrons within it are once again radiating mostly at radio frequencies, according to a statement from NASA. The cloud is found in Abell 1033, a galaxy cluster of more than 350 galaxies about 1.6 million light-years from Earth. Astronomers working on the project believe the supermassive black hole that sits near Abell 1033's center erupted long ago, releasing a stream of high-energy electrons (subatomic particles that make up atoms) that formed a cloud hundreds of thousands of light-years wide and radiating radio emissions. As the electrons gradually lost energy over millions of years, the cloud's emissions began to fade, the NASA statement said. Galaxy clusters can consist of hundreds or even thousands of individual galaxies, as well as dark matter, and huge reservoirs of hot gas, the NASA statement said. As the electron cloud in Abell 1033 grew dimmer, another cluster of galaxies slammed into the original cluster, sending shock waves through the system. An image of galaxy cluster Abell 1033 and the electron cloud known as the "radio phoenix." These shock waves, similar to sonic booms produced by supersonic jets, passed through the dormant cloud of particles, compressed the cloud and re-energized the electrons, essentially waking them up. The now wide-awake electrons once again radiated radio frequencies — the phoenix had risen from the ashes. 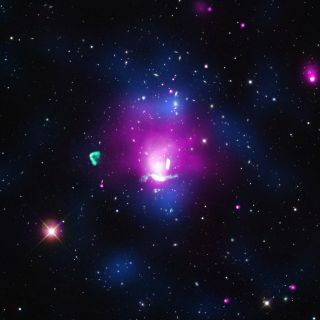 The image of Abel 1033 shows X-rays from Chandra in pink and radio data from the VLA in green. Background imagery comes from observations from the SDSS and a map of the density of galaxies, made from the analysis of optical data, is seen in blue. Astronomers believe this image shows the radio phoenix soon after it was resurrected, because these types of radio sources fade "very quickly" (on a cosmic scale) when located close to the center of a galaxy cluster, the NASA statement said. Because of the intense density, pressure and magnetic fields near the center of Abell 1033, scientists expect the radio phoenix to radiate for tens of millions of years.